Dr. Keith Alexander has redesigned the trampoline from the ground up and made jumping safe. How safe is your Trampoline? Each year more than 105,000 kids are sent to the hospital because of traditional trampolines – and that’s just in the USA. Learn from an independent expert why Springfree is the safest choice. Spring-based trampolines have metal coil springs that can pinch or injure a jumper. Springfree Trampoline uses flexible composite rods that lie beneath the jumping surface out of harm’s way. The frame on a spring-based trampoline introduces a hard surface into the jumping area. Landing on the frame can result in fractures, lacerations and head injuries. Springfree Trampoline’s frame is well beneath the jumping surface - you can’t hit it. The pads on spring-based trampolines do not protect from injury, lose much of their shock-absorbency after the first impact and have the shortest lifespan of any part on the trampoline. Springfree Trampoline’s SoftEdge mat is 30 times more shock-absorbent than pads. Spring-based trampolines enclosures use steel poles to support a rigid net. A jumper may collide with the steel pole, causing injury. Or slide down the net and land on the frame and springs. Springfree Trampoline's FlexiNet enclosure has flexible net rods that cushion jumpers and prevent falls. Multiple jumpers increase the risk of injuries and it is the smaller/lighter of the two jumpers that almost always gets hurt. Untrained jumpers run the risk of landing awkwardly. When jumping, leave the toys outside the trampoline. Toys and other objects on the trampoline introduce tripping hazards that you could hurt yourself on. Keep an eye on young jumpers to ensure they are jumping safely. Do not allow children or pets underneath the trampoline when someone is jumping. Take the time to learn the basics of jumping; this will help you stay in control. Always enter and exit the trampoline using a ladder or with the help of an adult. Talk to your kids about the importance of using the trampoline safely. While Rover & Whiskers might want a turn they can scratch your trampoline mat and it is best if they stay on the ground. Springfree is not only committed to building the world’s safest trampoline, we are also leaders in the advancement of the industry’s safety standards. Our team is proud to have been involved in the development and revision of many safety standards now in place around the world. Unfortunately most trampoline safety standards are not mandatory and, in many countries, trampolines that do not meet any standard are still able to be sold. This puts the responsibility on retailers and owners to do their research to make sure the trampoline they select is a good choice. 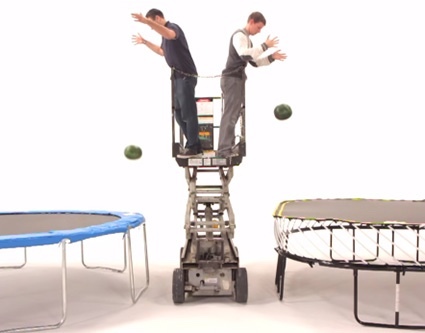 USA ASTM F389-14 Covers the components, assembly, and use of consumer trampolines. It is intended to reduce the risks associated with the use of trampolines at home. USA ASTM F2225 - 013 Covers the performance and safety requirements for trampoline enclosures and addresses the manufacturing and assembly of components, maintenance and use. USA ASTM F2774-09 Covers standard practice for testing the quality of consumer trampoline mat material. Europe EN 13219:2008 Specifies functional and basic safety requirements for the use of gymnastic trampolines. Europe EN 71-14 Aims to reduce those hazards that may not be evident to users; This standard does not cover inherent hazards that should be obvious to consumers. Australia AS4989-2006 Covers minimum acceptable design standards and consumer information requirements. This standard is not mandatory and trampolines for sale in this region are not required to be compliant. This standard is currently under revision.